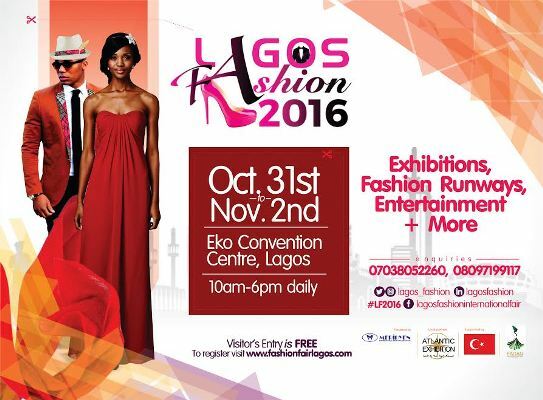 Are you a fashionista, shopperholic, trendsetter, celebrity, fashion icon, stylist or none of these but you wear clothes?Introducing the Lagos Fashion Fair 2016, the biggest ready to wear international fashion fair in this part of the world! This event offers an opportunity for designers, fashion professionals, boutique owners, stylists, fashion retailers, models, trendsetters and consumers to interact, network and build business relationships with our Nigerian and European exhibitors. This year’s event will also feature loads of entertainment activities like runway shows, musical performances, freebies, raffle draw and more! Plus, we have a very special raffle draw strictly for our social media followers. Prices to be won include sewing machines, washing machines, steam irons, tabs, microwave, power bank and lots more. To participate in the draws, follow us on twitter and instagram; @lagos_fashionand like our Facebook page;facebook.com/LagosFashionInternationalFair and then send your number to08164757423 and we will send you your raffle draw code! he draws will be done daily during the Exhibition from Monday, October 31st 2016 to Wednesday, November 2nd 2016 at the Convention Centre, Eko Hotel and Suites, Lagos. Over 100 exhibitors from around the world have been confirmed for this event including fashion brands like Regalia by FAL, Modella, Jeanne D’arc, Daviva, Gbemisoke Shoes, Em Bruto by VJ Adams, Mondo Tekstil, Kola Kudus,Temelli San. Ve Tic., Josh Amor, JM Clothing, Kymo-Kr8tiv-Fashion, Grace Hats and Ideal Tekstil. And the juiciest part is, it is absolutely FREE for visitors throughout the 3-day event, so there’s no excuse not to spice up your style!